In 1966, Carlson was working toward his M.B.A at San Francisco State University. To fulfill a requirement, he took an art class, and the teacher suggested the students build a glass studio and learn to blow glass. As a result, Carlson’s career path took a different direction, and in addition to his M.B.A, he also received an M.F.A. This bowl, from his Asian Fusion Series, combines his interest in Siletz Indian baskets, design and the color red. 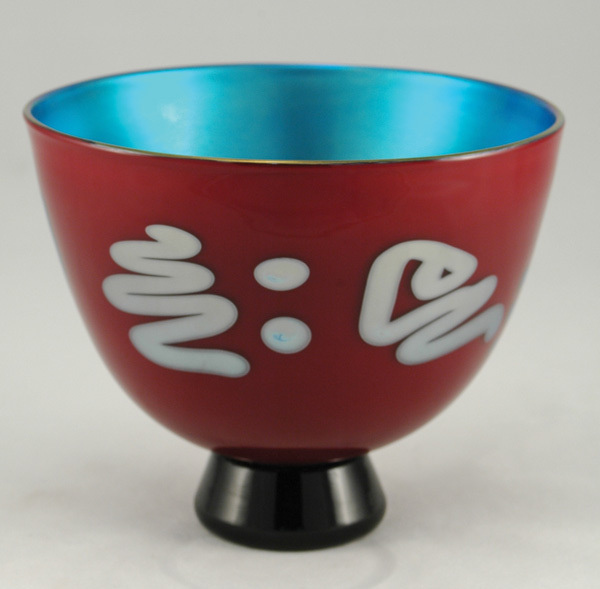 To make the vessel, Carlson fused three layers of glass: an interior layer of blue lustre, an exterior layer of red with silver designs melted into the glass, and a middle layer of white to enhance the red. Carlson’s wife and assistant, Karen, blows the 10-inch bowl’s glass base. “Glass-blowing is a great process,” Carlson says. “I like working with my hands and being able to make something beautiful.” Carlson’s bowls range from $180 to $500, depending on their size and style. This one is available for $425. Contact glass artist Donald Carlson via his website, carlsonartglass.com. More of his glass art is available at The Real Mother Goose (901 S.W. Yamhill; 503-223-9510) in downtown Portland.